"Afro-Uruguayans" refers to Uruguayans of predominantly Black African descent. 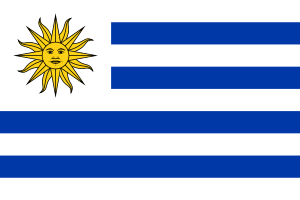 The majority of Afro-Uruguayans are in Montevideo. For most of the colonial period, the port of Buenos Aires (see Afro-Argentines) served as the exclusive entry point for enslaved Africans in the Río de la Plata region. Slaves entering the port of Buenos Aires were then regularly shipped inland to Córdoba and the northwestern provinces of Salta and Tucumán in Argentina, across the Andes Mountains to Chile (see Afro-Chileans), and to the mines of Potosí in Alto Perú (see Afro-Bolivians). Candombe's origins lie in the "Kings of Congo" ceremonial processions from the period of African slavery in South America. Candombe is related to other musical forms of African origin found in the Americas such as Cuban son and tumba and Brazilian maracatu and congadas. The form evolved by the beginning of the 19th century. ↑ "Encuesta Nacional de Hogares Ampliada 2006" [Extended National Household Survey 2006] (in Spanish). 2007. Archived from the original on 11 May 2012. Retrieved 22 October 2011. ↑ Felipe Arocena. "The contribution of immigrants to Uruguay" (PDF) (in Spanish). multiculturalismoenuruguay.com. Retrieved 6 March 2014. Wikimedia Commons has media related to Afro-Uruguayans.